Drive to the store and save gas? It's possible to save gas whether you drive or bike to the grocery store. A 2002 study from the John Hopkins Bloomberg School of Public Health estimated that, using our current system, three calories of energy were needed to create one calorie of edible food. And that was on average. Some foods take far more, for instance grain-fed beef, which requires thirty-five calories for every calorie of beef produced. When we eat, we are consuming oil. There is no real way of getting around this entirely in our urban world, but we can do things to minimize the amount of oil we consume through food production and transportation. When I shop, I try to buy locally grown products raised using sustainable practices. The farmers market, Community Supported Agriculture (CSAs), and home gardens are the obvious ways to do this. Even with canning and freezing, most of us resort to shopping for many of our groceries, and there are ways to do this and minimize your consumption of fossil fuels. Vegetarians and vegans will be quick to point out that eliminating meat from your diet is perhaps the biggest way to reduce fossil fuels. If you, like me, are a natural-born carnivore, eating only locally pasture raised (grass-fed) animals can cut your fossil fuel impact by half. Hunting or raising and butchering your own grass-fed animals can cut the fuel impact further. Just buying locally raised products can remove much of the transportation impacts. According to an article in Harpers, the average American foodstuff travels an estimated 1,500 miles before being consumed. With a growing “eat local” consciousness among shoppers, many stores are now noting on the shelves which products are local. I even manage to buy locally produced, environmentally responsible cleaning supplies. If you look closely in my shopping bags, you will find some guilty pleasures enjoyed by various members of my family. I am far from perfect in my efforts to reduce the fossil fuels in my shopping cart, but I am conscious of the unseen costs of what I buy. When I am faced with choices, whether it be my mode of transport or whether to buy oranges from California, I try to consider how my decision impacts others and its costs to society and our planet. I wonder if this is why nobody in my family wants to go grocery shopping with me? You forgot to mention that going to the grocery store by bike means you get the primo parking spot every time. 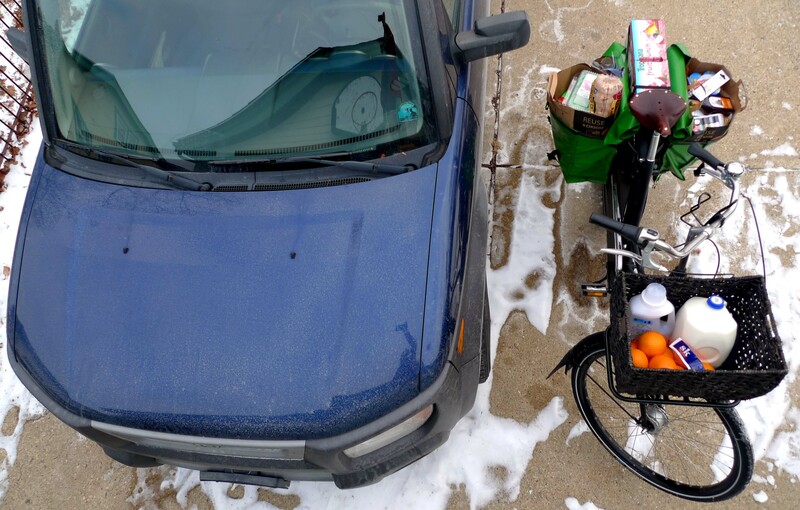 I have a similar list, and thought I’d share one great reason for grocery shopping by bike. Since space is at a premium even on a big Dutch bike, you have to prioritize your purchases. I tend to only buy what I need and usually don’t succumb to a lot of impulse purchases. (Usually.) I save money and calories, since I don’t always have room for that pint of ice cream. I also agree with the point about getting the best parking space. Imagine all the time you save not having to look for parking! What, no “family-size” boxes of Lucky Charms? Dave, I am sure glad you are writing again. Thanks ever so much. You are welcome Kevin, thanks for reading.